Ashby de la Zouch is a great place to live and work. We love our little Leicestershire town, famous for Ivanhoe, Adrian Mole, Mcvities and now a £50,000 structure in the North Street car park. It is safe to say that this new addition to the town has divided opinion. What Is the Ashby de la Zouch Sculpture? 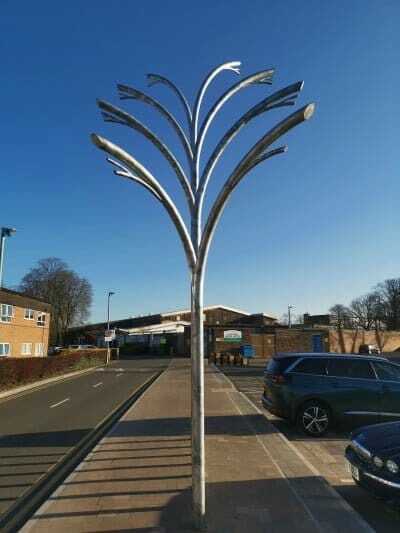 he sculpture, located in the North Street car park in Ashby, is a set of eight steel poles which reach over eight metres tall. The idea is to honour the connection between Ashby de la Zouch and the National Forest which surrounds the town. Creator, Adrian Moakes has titled the sculpture “The Heart of the Forest“. It sits in the centre of Ashby’s Culture & Leisure Quarter, which has recently also seen a £1.1 million investment in a new car park which sits adjacent to the new sculpture. The sculpture was installed on 13th March 2019 and consists of eight tubular steel curved columns reaching up to 8.5 metres in height. It is actually several sculptures in one – from two distinct viewpoints the shapes magically combine to form the image of a large majestic tree. As you walk around the area, every view creates different combinations of forms and connotations – an avenue of trees, family groups, a line of tall arches, a forest canopy or long grasses blowing in the wind. The branches reach out in all directions to express a welcoming, all embracing, uplifting and positive image of Ashby. Four days of public consultation were held during July and August 2018, where approval rating for the sculpture hit 99% from a sample of 400 responses. What Do Ashby Residents Think of the Sculpture? As with most art, opinions are divided. The sticking point to most responses on social media seems to be the cost. The reported £50,000 seems like a lot to spend on something which on the face of it doesn’t add any real value to the town. Comments on a town Facebook group (Spotted Ashby de la Zouch) post currently has 63 comments at the time of writing, the majority of which are negative. Most seem to say “waste of money” or “should have been spent elsewhere”. It is easy to see why there is a backlash. So overall a bit of a mix bag of opinions. With an investment like this by a local council, they would always try their best to use a local artist, or local materials, or even help to promote a local business right? Unfortunately not in this case. Not only is Adrian Moakes not local to Ashby de la Zouch, he isn’t even from the county, he is a Manchester artist. I personally think that this is something which we should take issue with. As an Ashby web design company, our job often involves helping local businesses to not only compete locally, but also to grow regionally or nationally. I would assume that the council would also want the local economy to thrive and where possible pass contracts to local companies where possible. We are so lucky to live in such a creative corner of the country with an abundance of talented artists and sculptors, who I’m sure would have loved to have been given an opportunity like this to celebrate their skills and improve their local town. Locations such as The Ferrers Centre at Staunton Harold are evidence of the talent which is on our doorstep. Unfortunately the council have got form for this: for example their website https://www.ashbydelazouch.info/ was built by a company in Coventry, and the branding for Love Ashby was undertaken by an agency in Nottingham. I’m not so naive to think that everything can be sourced in Ashby, but as far as I’m aware the council didn’t consult a single local web design or marketing agency regarding the Ashby “rebrand” and website. This may sound like sour grapes, but the fact is, the website doesn’t work and is poorly put together. I have alerted the developers about a number of issues, but after a few months don’t seem to have done anything to remedy the issue. By the admission of town council manager Stuart Benson, “I do feel that there are many issues with the website”. So it seems that their outsourcing doesn’t seem to work efficiently. It is easy to criticise, it is much harder to propose a better solution. How would you have spent the £50k? I personally would have preferred to see some real trees planted. I don’t think that anyone could object to that and surely it links the town to the National Forest much better than some metal poles made to look like trees? Or do you like the sculpture? We would be keen to hear your thoughts on this. This is our town, if we don’t air our views, then the decision makers don’t know how to best serve the people! Leave a comment using the form below and I will make sure that the comments are sent on to the relevant people.